FM-200® is the clear choice for a fast, clean fire protection agent. Introduced as a Halon replacement in 1993, it quickly gained acceptance as the world’s leading clean gaseous fire extinguishing agent. 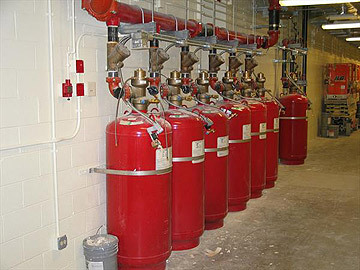 When it comes to fire protection, there can be no compromise. FM-200® extinguishes fire via a combination of chemically based fire inhibition and cooling. It is environmentally acceptable, safe to use with sensitive equipment, fast-acting, efficient and effective. When it comes to fire protection there can be no compromise. In April 2002, Ged Brock – Great Lakes Chemical Company, USA; patented manufacturers, FM200 and Nick Grant – Macron UK Ltd; leading distributor of FM200gas in Africa, at a Halon Replacement and FM200 seminar, gave public credence to HILTRON a subsidiary of LIGHTNING NETWORKS as the authorized representative for Macron systems and Official Fill Rig operator having fulfilled all quality and capability requirements for same. – contact us today to learn more about our FM-200 system solutions.